Deiva Marina is a famous seaside resort in the Riviera of Levante. 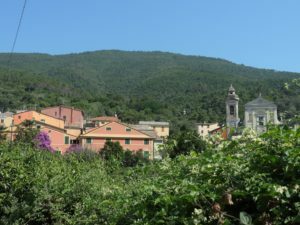 The village has two distinct nucleus: the old village, surrounding the church of Sant′Antonio, and the Marina, overlooking the sea. Deiva Marina offers a typical Mediterranean climate, a big sandy beach and a pure sea, often awarded with the European Blue Flag. The great number of paths stretching throughout the conservation area “Monte Serro – Punta Mesco” offers good observation points to admire olive groves, vineyards, pinewoods, chestnut woods, ilex groves and cork-oaks. By sea one can reach beautiful inlets hiding quiet small beaches, where to enjoy the sun or the rich underwater habitat through diving. In Deiva Marina you can choose within: sailing, swimming, windsurf, water-skiing, fishing. In addition, it also offers a football field, tennis fields, bowls area, riding school and gym. For those who love walking or biking, Deiva Marina represent the ideal basis to make trips in the surroundings.